Posted on September 2, 2017 at 4:05 pm. Most of the focus of a kitchen design goes into choosing everything from the cabinet color to flooring materials to countertop choices, but cabinet drawer interiors often get overlooked. Custom cabinet design doesn’t need to end with the hardware. There are several advantages of custom kitchen cabinet interiors that add practical accessories, bins, storage racks, and drawers. Unique and well-built storage solutions will automatically improve the usability and organization of your kitchen. With so many creative storage solutions from pull-out shelving to spice storage, the possibilities are endless. Pull out shelves in a bottom cabinet are a great way to organize pots and pans eliminating the need to crouch down and crawl inside the cabinet to find what you need. The top shelf is a handy place to store lids. Make the most of your drawer space with custom-made utensil organization. 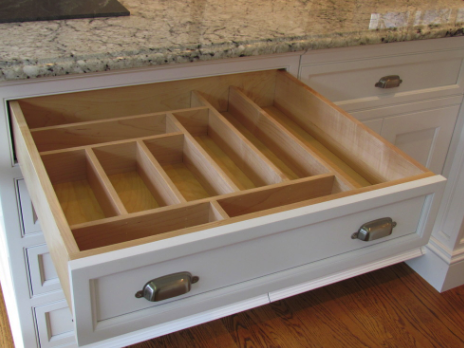 Unlike pre-made silverware trays, custom organization makes the most of the entire drawer space putting an end to useless gaps and spaces where pre-made trays fall short. Pull-out storage next to the cooking range is a convenient place for spices and other items for easy access while cooking. The open sides allow for easy visibility. This double bin pull-out is a must-have for hiding unsightly trash and recycling bins. 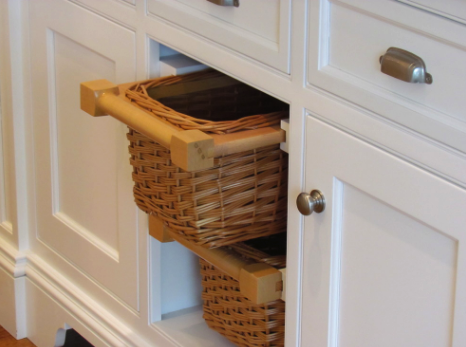 Under the counter baskets add texture to a kitchen design and help to give the space warmth. 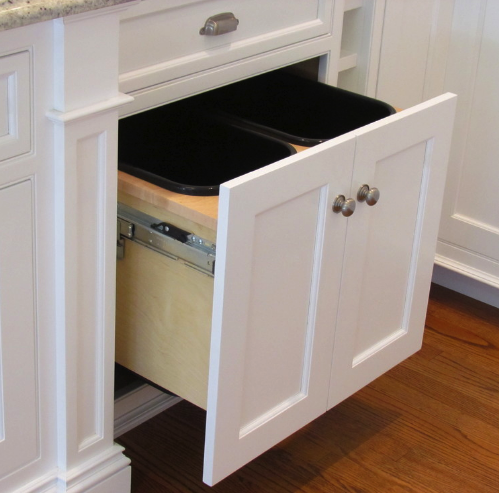 This is a great spot to store anything from root vegetables to linens and is a favorite addition to kitchen islands. Hideaway storage is key to keeping a kitchen looking well organized and clean. 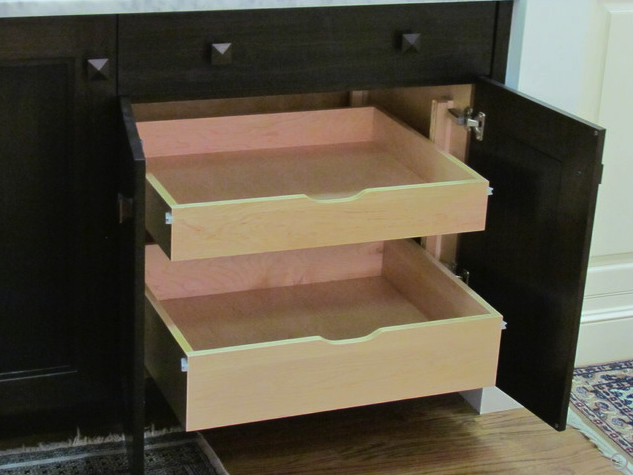 Creative drawer and cabinet storage can revolutionize your kitchen experience entirely. Other ideas include a cookie sheet drawer with vertical spacers, an appliance “garage,” or dish drawer. 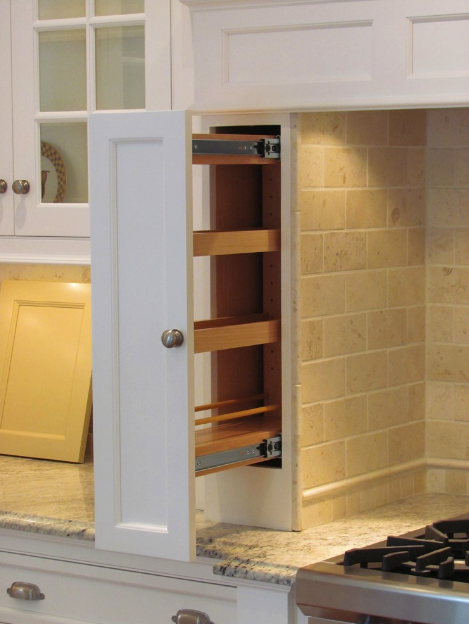 We’d love to know: What cabinet storage addition has been a lifesaver in your kitchen?